At the age of 17 I started working as a roofing plumber in an uncle’s raging heterosexual “no sheilas” business. Deeply confused, having survived a highly violent and homophobic upbringing, this job seemed like a way out. After two years of macho theatrics, I left. I moved into the city and got a job in a 24-hour newsagency in Kings Cross. One day in 1987, while stacking newspapers, I saw an advertisement for UK-based dance company, Michael Clark & Company. At the time I was attending a group for young survivors of abuse and our facilitator, Faye, organised an excursion to see their show. This was a massive game changer for me. Afterwards Faye found the Bodenwieser Dance Centre and the following year, aged 20, I began full-time training, graduating in 1990. I mention this early personal account to outline the importance of outreaching to marginalised groups and individuals, if for no other reason than to include a more diverse range of human experiences in dance practice within Australia. Faye also sparked a seismic change in my life by helping to guide me. I have never forgotten this and have maintained an inclusive practice for much of my 26-year career. Having facilitated many workshops since the early 1990s for community centres in Western Sydney (and for a week in NYC in 1998) for traumatised and suicidal youth, I can vouch for the fact that many kids with complex trauma disorder (CTD) symptoms are too traumatised to attend a tertiary arts course without considerable guidance. There is currently no dance course catering for people living with disability (PLWD) in Australia. Inclusion starts with education so why isn’t there a course that is inclusive? Further disclosure: my name is Dean Walsh and I live within the arts. I also live with autism spectrum disorder (ASD) that has lain hidden beneath the largely misunderstood CTD. I’m not one to say that, if I’d known earlier, “I wouldn’t change a thing,” because if I could, I most definitely would have. However, we cannot change the past nor our genetic make-up so we must learn to survive, in other words, adapt. I have carved out a career where I’ve sought to communicate, through dance and performance, diverse experiences—lower socio-economic life, domestic violation and LGBTQI stories—without apology and without pity-pulling. I know now (I was diagnosed in 2015) that my autism has driven most of these works with a need to tell-it-like-it-is and in great detail. I largely devised my works in solitude because other people often confuse me. Their input more often than not tips me into overdrive that can lead to complete physiological and emotional meltdowns, sometimes for days on end. Coming out of these is like being liberated after days stuck in a room of white noise and conflicting thoughts (pictures) played at the highest frequency. When I think of the days I’ve lost to these meltdowns, I would say they’d equate to a couple of years. There have been months on end when I’ve been unable to be around many people because of the exhaustion of trying to pretend they make sense. Solitude is bliss but also a curse. Then in 2007 I found scuba diving. I am happiest underwater, in deep pressurised space where people don’t talk or confuse me with myriad conflicting expressions and ideas. All I need to focus on is my technical equipment, a quieter and more sensitive social interaction and the series of stunning pictures around me that are relayed within the sensory medium that immerses me—environmental integration. I’m very adept at adapting, like so many other people I now know. When we adapt we learn new skills for life and when we learn we have something more we can pass on, keeping the wheel of progressive social change revolving. This is a good thing. However, we need more platforms from which to share our findings. The Accessible Arts Catalyst Masterclass and Residency series in Sydney (2012-2016) is one such platform I’m very pleased to say I’ve taken part in. This program has the capacity to spark seismic shifts nationally when it comes to the inclusion of difference within dance. The arts are good for many reasons, not least for sharing, questioning and showcasing the diversity of our existence as it evolves, contemporaneously. When we do this authentically, from a core need to understand and express ourselves better, I believe we are being truly innovative rather than superficially trying to tick a box. As artists we are not just innovating when we choreograph or direct new works but also in the methods we employ while researching, teaching and facilitating our arts practice beyond conventional theatre stages. Some artists choose to focus on quite limited choreographic aesthetics, some with very narrow definitions of beauty and ability. Others, myself included, look to challenge this constantly, not only through artistic choice but as a lived necessity. Adaptation (and one could call this innovation) is, for some of us, an intrinsic part of daily life, not just a work ethic or funding prerequisite. I have recently started to ‘come out’ as autistic and this has sometimes been met with incredulous scoffs, dismissive shrug-offs, rolling eyes and even outright laughter. For me, this is no laughing matter. And there’s that awful, dismissive, “Oh, but we’re all on the spectrum; we’re artists.” The Autism Spectrum has been analysed for decades and defined by the World Health Organisation and many other global and national agencies and experts, for very important reasons. It articulates a level of severity of a whole range of autistic experiences, not just your average, creative, single-focused drives. People who live on the spectrum are nine times more likely to suicide than neurotypical people, due, often, to a lack of understanding, including not being believed. Our artistic expressions have the potential to reflect upon and challenge prejudices and satiate the ceaseless human desire for exploration and knowledge. The inclusive arts community has begun to grow exponentially in Australia, adopting a sense of unorthodox practice like no other arts sector I’ve ever worked within. Through its Catalyst series, Accessible Arts has promoted this and embraced my developing movement research with openness and encouragement. A further prerequisite for innovation is to allow artists to try things out: ‘failure’ is part of that process. In 2010 I received a two-year Australia Council Fellowship to further my methods of research into marine environmental understandings, in order to formulate means with which to express these through movement and develop a practice intrinsically focused on reconnecting us to environmental realms—the oceans. I call this practice PrimeOrderly—embodied environmental awareness research [see an interview here. Eds). I think there is huge potential in the arts for us to be more inclusive of people of greater physical, intellectual and neurological diversity. In fact, I feel this could be the next major evolutionary arts movement. But it must be steered by people living with disability or those who are authentically invested in the sector. This movement would have its basis in ethical practice. It could also teach us to be less elitist and egotistical and more versatile in our approaches to performance making. This is not to say we cannot continue to be methodologically rigorous. In dance terms, inclusive practice could lead to the acknowledgement of a need to develop entirely new inclusive methodologies enabling people with disability to develop systems that best support and express their inquiries as artists and communicators; from this we could all learn so much more about the human condition. For all we know (or thought we knew), a social revolution could ensue. 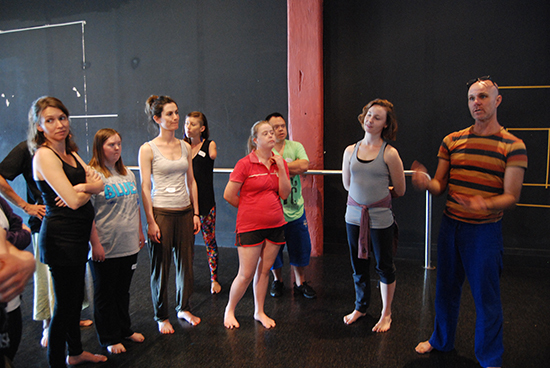 In collaboration with Ausdance NSW and Accessible Arts, the Catalyst Dance Program engaged dancer and choreographer Dean Walsh, a long-time supporter of the program, to write this article around his work in integrated dance. Read Part II, where Dean Walsh describes how he has worked with and been inspired by Restless Dance Company, Catalyst Dance and RUCKUS. Accessible Arts’ Catalyst Dance is an intensive integrated dance skills and career development program that includes working with key national and international dance leaders and artist mentors. The Catalyst Dance Residency is a national artist development program across two years initiated by Accessible Arts; the most recent was held at Critical Path, Sydney, 21-27 August this year. Dean Walsh has worked in Australia and overseas as a performer, director/choreographer and teacher, including as a dancer with companies such as DV8 Physical Theatre, Stalker Theatre, Japan Contemporary Dance Network, Australian Dance Theatre, Opera Australia, The opera Project, Sydney Dance Company and One Extra Dance. He has a long and deeply held personal interest in marine ecology, biology and interactive disciplines (surfing, snorkelling, scuba and breath-held diving), which forms the basis for his most recent choreographic explorations. Since 1991 he has devised more than 35 dance/performance works from solo through to small groups. He recently presented two 30-minute group movement lecture demonstrations as part of World Parks Congress, a multi-national event held every decade and attended by more than 4,000 delegates from 166 countries. Read articles about Dean Walsh in our RealTimeDance dance archive. Walsh was co-director and choreographer for Speed of Life, produced and performed by RUCKUS, a Sydney-based disability-led ensemble. Read the RealTime review. Read an interview conducted by integrated dance choreographer Philip Channels with Dean Walsh.